Directions: Take I-44 (Will Rogers Turnpike) to Big Cabin exit. Take Highway 69 south to Highway 28 east to Pensacola. Take road 4400 to road 350—turn left. The battlefield site will be on the left. Open daily from dawn to dusk. Use of drones over Oklahoma Historical Society property is not permitted without written approval of the facility director. The Cabin Creek Battlefield is the site of two important engagements between Union and Confederate forces in Indian Territory during the Civil War. The site is located along the Texas Road, a historic trail from Kansas to Texas, near the ford that crosses the creek. The road was used by Indians, white explorers, US Army, pioneer immigrants, trail herds, and traders. Joseph Martin, a mixed-blood Cherokee, built a ranch west of the crossing around which a small community grew before the Civil War. The Texas Trail was the conduit for military supplies moving south from Fort Scott, Kansas, to Fort Gibson, Indian Territory, during the war. Several minor skirmishes occurred at the Cabin Creek crossing area. The first was a skirmish on May 8, 1863, near Martin’s house, Cabin Creek, of which very little is known. The first of the two important engagements occurred July 1–2, 1863, known as the First Battle of Cabin Creek, and was an attempt by Confederate forces under Colonel Stand Watie to capture a Federal supply wagon train. The Federal troops were commanded by Colonel James Williams whose force consisted of the Third Indian Home Guard and the 1st Kansas Colored Volunteer Infantry and units from Colorado, Kansas, and Wisconsin. Watie’s troops contested the ford but were driven off by artillery fire followed by infantry and cavalry charges. On July 5, 1863, a skirmish occurred involving the Kansas 2nd Battery, Light Artillery. Later, on July 20, the First Indian Home Guard skirmished with Confederates. The Second Battle of Cabin Creek on September 19, 1864, was another attempt to capture Federal supplies en route to Fort Gibson. Brigadier Generals Richard Gano and Stand Watie made a night attack on the Federal encampment that routed Union defenders. The supplies and 130 wagons were captured. This was the last major engagement in Indian Territory during the Civil War. Preservation efforts began in 1961 when the Vinita Chapter of the United Daughters of the Confederacy purchased a ten-acre parcel in the core battlefield area. Later that year, the acreage was donated to the Oklahoma Historical Society, which has administered the site. A circle drive loop within the ten acres provides access to monuments and signage telling the story of the site. The Friends of Cabin Creek Battlefield, Inc., a group of dedicated citizens, form a non-profit organization that supports the preservation efforts. 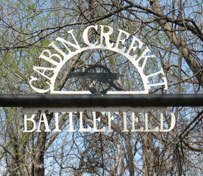 Visit The Encyclopedia of Oklahoma History and Culture to learn more about the battles and history of Cabin Creek.